Rip Currents are powerful, channeled currents of water flowing away from shore. They typically extend from the shoreline, through the surf zone, and past the line of breaking waves. 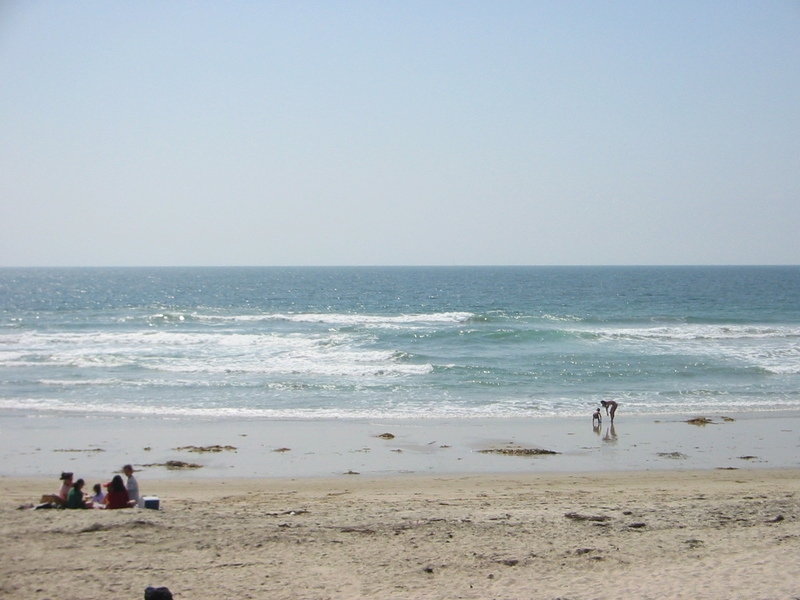 Rip currents generally form when waves approach normal to the shoreline or at a slight angle. Rip currents can occur at any beaches with breaking waves, including beaches on open oceans and in the Great Lakes and in a Bay. As waves travel from deep to shallow water, they eventually break near the shoreline. As waves break, they generate currents that flow in both the offshore (away from the coast) and the alongshore directions. 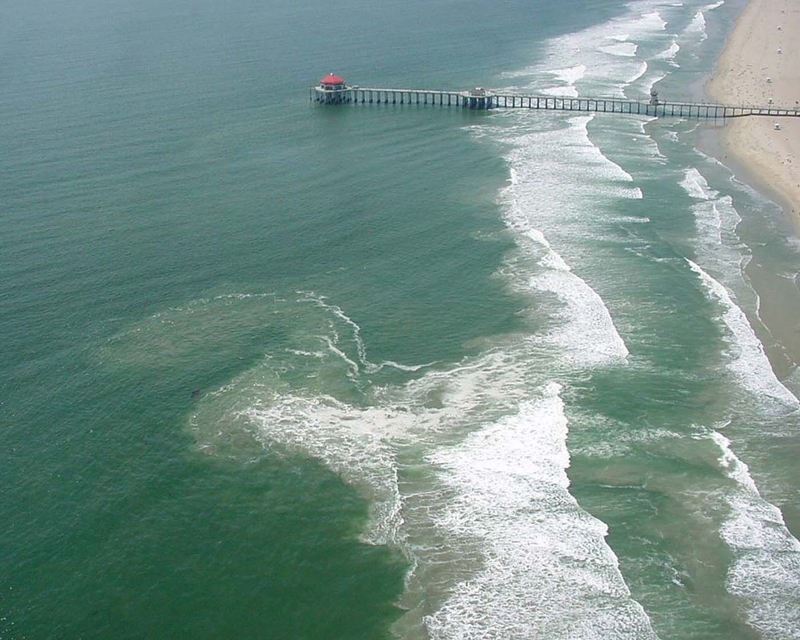 This offsore or seaward flow of water typically occurs through a break in the sandbar, where water is channelized into a narrow current known as a rip currents. Waves break on the sand bars before they break in the channel area. Wave breaking causes an increase in water level over the bars relative to the channel level. A pressure gradient is created due to the higher water level over the bars. This pressure gradient drives a current alongshore (the feeder current). The longshore currents converge and turn seaward, flowing through the low area or channel between the sand bars. Learn more in the COMET training module "Rip Currents: Nearshore Fundamentals". 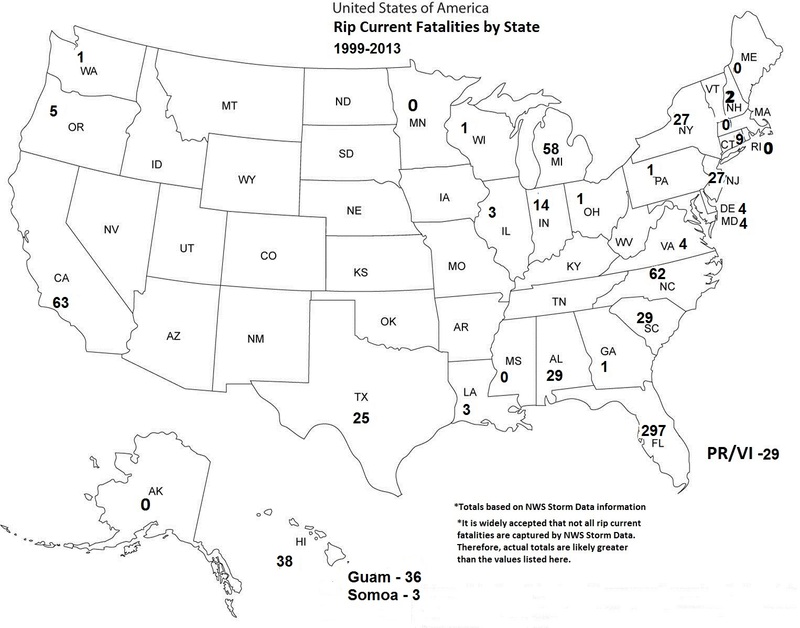 Click here to see more images of rip currents. Highest scenarios of rip hazards are not high surfs but high exposure of in-sea beach users during warm water in summer-fall period. When low energy, longer period of waves (significant wave heights of 0.5 -1.5 meters in 10-15 sec sequence ) led to highest number of rip incidents. During spring/neap or daily very low tidal cycle, a mass rescue event can cause 200 s rescues in several places of a beach or several beaches under the same conditions. A rip threat risk index can help reduce rip fatalities by local Weather Forecast Office working in collaboration with beach lifeguard safety teams. A short-term warning and an outlook for 24 hours ahead will be desired.